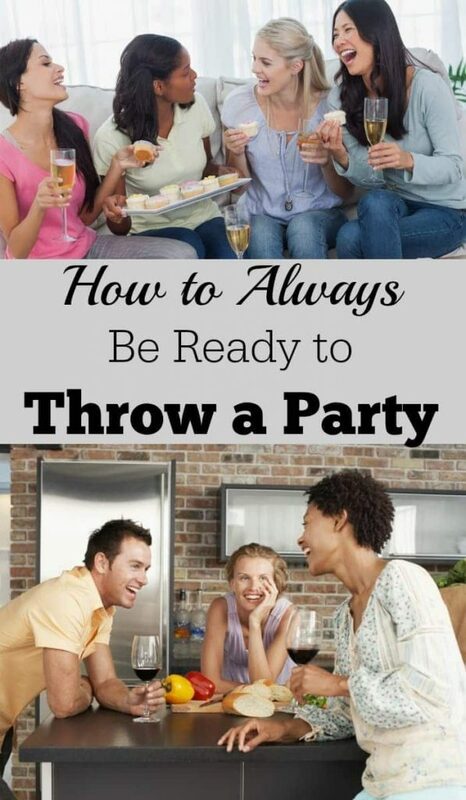 Don’t pass up the opportunity to have friends over just because you haven’t had time to plan a party. Use this impromptu party supply list to keep your kitchen stocked with essentials that make spontaneous gatherings a breeze! I also have a collection of platters, bowls (both small and large) and serving spoons and tongs. Since I don’t have unlimited cabinet space, I stick with plain items that can be used any time of year. You can add color with decorations, table linens, and fresh flowers to “theme” your party. For our outdoor parties, we built several picnic tables. Compared to outdoor patio furniture, picnic tables were far less expensive and comfortably seat 6-8 people. In addition, we can easily arrange them around the yard. For indoor parties, we’ve invested in several folding chairs that we keep in a storage closet. They are lightweight, fold flat so they don’t take up much storage space, and are an easy way to create extra seating for indoor parties. I have several quick and easy appetizer and snack recipes that I fall back on for impromptu parties. I try to keep a combination of the following items on hand. These are mostly things my family eats on a regular basis anyway. Of course, you can always just order pizza too! If you don’t normally drink alcohol, you can probably skip the wine and beer. Alcohol is the most common gift your guests will bring so it’s likely you’ll end up with more than enough. For a lively crew, karaoke is always a riot. And if you have a video game console, you and your guests might also get a kick out of playing Just Dance. Hopefully these tips and ideas will make it easier for you to have what you need on hand to invite people into your home on a moment’s notice. Whether you use the suggestions above or not, I urge you to take every opportunity you can to spend time with friends. Life goes by too fast to miss opportunities to connect because of small details (e.g. you haven’t dusted this week or you don’t have any party food).